What do plastic surgeons think about the Keller Funnel? The Keller Funnel is a device used during breast reconstruction or augmentation to insert silicone gel breast implants. Implant placement via the Keller Funnel allows for smaller incisions, shorter surgery time, and faster healing. Plastic surgeons prefer the Keller Funnel because its specialized no-touch technique reduces the risk of bacterial contamination and capsular contracture. The Keller Funnel was devised by Dr. Kevin M. Keller of Keller Medical, Inc., purchased by the pharmaceutical company Allergan in 2017. Although the Keller Funnel looks something like the sort of clear, plastic, pastry bag you’d use to frost and decorate a cake, plastic surgeons use it as a tool for implant delivery. Initially introduced in 2009, the Keller Funnel works specifically with silicone gel implants for the breasts, calves, or gluteal region. Regardless of the implant’s destination, the Keller Funnel requires the same four steps: trim, hydrate, load, and propel. In the operating room, the plastic surgeon removes the Keller Funnel from its sterile packaging and trims the narrow end of the funnel to form a small hole along markings that match the size of the implant. Then the surgeon hydrates the Keller Funnel, using a sterile solution. They then load the Keller Funnel by pouring the silicone gel implant inside. In the fourth and final step, the tip of the funnel is placed into the preformed body pocket and the surgeon propels the implant into place by pushing and squeezing on the Keller Funnel. In the case of breast implants, each funnel is used for both implants on a single patient and then discarded. According to Allergan, the Keller Funnel reduces direct contact between surgeons and silicone breast implants because the implant travels through the sterile funnel into the breast pocket, as opposed to being compressed and inserted with the surgeon’s hands. It also eliminates contact between the implant and skin at the incision site. This process, referred to as the no-touch technique, dramatically lowers the risk of infection often caused by bacterial contamination. A study also revealed that 93 percent of plastic surgeons surveyed said that using the Keller Funnel makes silicone breast implant delivery easier overall than the traditional method. One thing that makes it easier is that the Keller Funnel allows plastic surgeons to make the smaller incision lengths associated with periareolar and inframammary incisions, thereby increasing the probability of smaller scars and faster healing. The cost of the Keller Funnel is $140. Some surgeons will pass the cost onto patients when pricing out a breast augmentation. When it was introduced in 2009, the Keller Funnel was the first of its kind. Before that time, surgeons frustrated with having to force a large implant through a small hole would often create their own contraptions to make the process easier by using lubricated plastic bags. Yet even with the introduction of the Keller Funnel, most plastic surgeons still don’t use the device. With prices as high as $140 each, cost is clearly an issue. In 2017, NJ plastic surgeon Dr. Paul Rosenberg attempted to address this problem by introducing the Inplant Funnel, licensed and sold by Proximate Concepts, LLC. 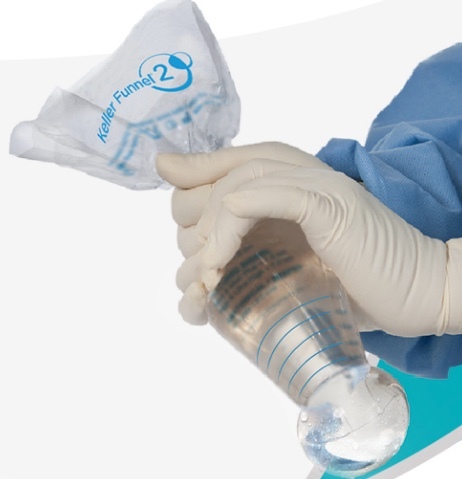 The Inplant Funnel functions in almost exactly the same way as does the Keller Funnel except that the breast implant is inserted through a “ziplock” opening on the side, rather than through the end. The InPlant Funnel also advances the “no touch” concept by a sophisticated and completely closed system of activation which permits the implant to glide easily into the patient’s body. But the biggest advantage of the Inplant Funnel is that it costs almost half as much. Dr. Sachin Shridharani, of New York City’s Luxurgery, says that the Keller Funnel not only requires shorter incision lengths for large implant insertion but also decreases manual trauma to the implant itself, reducing the risk of implant rupture. Although further studies are needed to confirm that reduced risk. Dr. Shridharani points out that “the Keller Funnel can affect the cost of surgery, since the funnel has a cost associated with its one­ time use. Some surgeons pass the cost onto the patient while others absorb the cost.” Dr. Matthew Martin of Elite Plastic Surgery in Grand Rapids, MI has found that in the case of breast reconstruction the cost of the Keller Funnel may be covered by insurance. He adds that the Keller Funnel “has use in both cosmetic breast augmentation and post­mastectomy breast reconstruction procedures. It is not generally used when placing a tissue expander into a breast incision following mastectomy [or] saline breast implants for either cosmetic or reconstructive reasons.” He also says that plastic surgeons try to minimize incision lengths, despite the fact that the diameter of silicone implants can be as much as three times the size of the incision. But limiting the size of the incision is a crucial precaution that helps to limit both bacterial contamination and capsular contracture. Capsular contracture is a complication of breast augmentation surgery that arises in 5% of women who undergo the surgery. Caused by internal scar tissue forming a restrictive capsule around a saline implant or silicone gel implant, capsular contracture compromises the overall shape of the breast, leaving it stiff and painful to the touch. Unfortunately, the only way to effectively treat capsular contracture is by surgically removing the capsule. Ultrasound, anti-inflammatory agents, and other approaches have not yet proven to be effective. Plastic surgeons are confident that devices like the Keller Funnel and the InPlant Funnel dramatically reduce the risk for this complication. Surely, they represent a safer future for breast augmentation surgery, promising better patient outcomes. To find a plastic surgeon that uses the Keller Funnel or InPlant Funnel, or for general medical advice about cosmetic surgery, let Zwivel help connect you with a Cosmetic Doctor.